I’d believe anything’s possible. I’d be inspired. Worldwide, there should be an obligation for doomsayers, negativists and pessimists to watch this film. I’m sure it won’t make them happier, because most of them are hopelessly lost and trapped in their negative spiral. But maybe there will be a few individuals who’ll understand the message of this action packed futuristic Disney movie. The message that positivism and optimism are better features to make a better world out of the present world. Perseverance and self belief will make you reach your goal. Such optimism luxuriated in the sixties. Because of that optimism progress was possible and the future looked brighter. In today’s world, the future looks frightening and menacing. And that’s how we get to know Frank Walker. An eager young inventor who firmly believes that his jetpack could be useful. Even if it doesn’t work flawlessly. We meet him during the World Expo at Flushing Meadows in 1964. 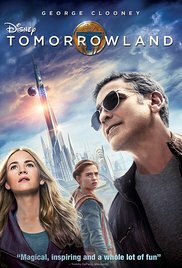 With the aid of the lovable girl Athena (Raffey Cassidy) he discovers a futuristic world called “Tomorrowland“. A safe world situated in a parallel dimension where technological progress hasn’t stopped and serving as a shelter for visionaries and geniuses. However, they couldn’t avoid one particular fact. The world we’re living in, is heading towards a devastating catastrophe. And that’s when Casey Newton (Britt Robertson) comes up. Together with the older Frank Walker (George Clooney), who’s banned from Tomorrowland, and Athena, she tries to turn the tide. You’ll easily see this is a Disney product throughout the entire film. It’s all beautifully visualized with breathtaking images and unparalleled special effects. It certainly would fit nicely as an attraction at a Disney theme park. Tomorrowland looks extremely futuristic and you won’t be able to take it all in. It reminded me of futuristic cities from comic strips and went from one surprise to the next. You’ll be awestruck by the dazzlingly spectacular images of flying vehicles driven by an unknown traction, floating pools and curved landscapes (same as in “Interstellar” and “Elysium“) full of strangely shaped buildings. The “Eiffel Tower” moment is fantastic and grotesque at the same time. Unfortunately the Disney input ensures that it sometimes feels rather childish. Towards the end, the message sounds quite moralistic. It gave me that 60s feeling full of values and standards which were applicable at that time. In our case we have to take care of the current environment and try to bend our egocentric thinking into a sense of solidarity. Of course in the end we got an obligatory emotional moment. Fortunately we could also admire some excellent performances. Clooney has omitted his pose as Nespresso charmer and appears as a capricious genius. But especially young Cassidy steals the show, both in the action-packed as the sentimental moments. “Tomorrow Land” (or “Project T” as it’s known here because the original title is a registered name of an eponymous music festival) for once isn’t a book-based movie, prequel, sequel or reboot. It’s a unique project targeting the whole family. It was pleasantly entertaining and exciting enough. Besides the corny, predictable end it was actually all right and I don’t really understand all the negative criticism.